Did you know August 13 is the 29th annual Left-Handers Day? Lefties make up just 12 percent of the population, according to World Book Online. Given that statistic, it's interesting to note that a number of famous musicians are left-handed—especially guitarists. Playing the guitar when you're a lefty presents a specific challenge: Most guitars are built for right-handed players, so how do you adapt? Blues legend Albert King turned a right-handed guitar upside down to play with his dominant left hand. So did Elizabeth Cotten, one-time housekeeper for the Seeger family of folk music fame who wrote the beloved song "Freight Train." Jimi Hendrix also played right-handed guitars upside down, but with the strings reversed, allowing his left hand to create unique tones and effects. 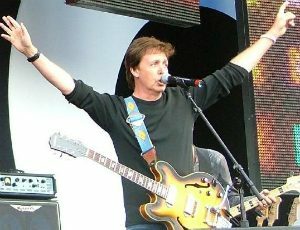 Paul McCartney plays with left-handed guitars and basses. So did Kurt Cobain. Other lefties play right-handed, including Smashing Pumpkins' Billy Corgan, Oasis' Noel Gallagher and Dire Straits' Mark Knopfler. What about musicians who play other instruments? Drummer Phil Collins is left-handed and plays a left-handed drum kit. Contemporary letters and reviews hint that perhaps Mozart, Beethoven and violinist Nicolò Paganini might have been lefties. Paganini's incredible skills led audiences to believe he had made a bargain with the devil. Paul Wittgenstein, an Austrian concert pianist who lost his right arm in World War I, commissioned composer Maurice Ravel to write a piece specifically for him, Piano Concerto for the Left Hand in D Major. In 2015 and 2016, Chicago Tribune columnist Howard Reich wrote a moving series of articles about retired Lincoln Park High School choir director Norman Malone, a pianist who lost the use of his right hand in a traumatic childhood incident. Malone spent a lifetime perfecting the Ravel piece and performed it publicly with the West Hartford Symphony Orchestra in 2016.
Who's your favorite left-handed musician?